Welcome to Twenty Question Tuesdays with TechHub Swansea. Last week we said hello to the newest member of the team, Eleri. This week, we turn to Jim Frewin, a contractor at the DVLA. I quickly (painfully) learned when I was presented with my Karate Black belt that you are never an expert... just a little further down the learning journey than others. Currently a little further down the understanding agile ways of working journey than some. Living in a Swansea hotel for number of nights a week should never be described as normal. I started straight from school as a Post Office Telephone Engineering Apprentice so have been involved with various forms of technology for 46 years - I might even get the hang of it one day! Helps people to understand and learn through experience of agile ways of working which in turn helps organisations to become more agile � a real win win! 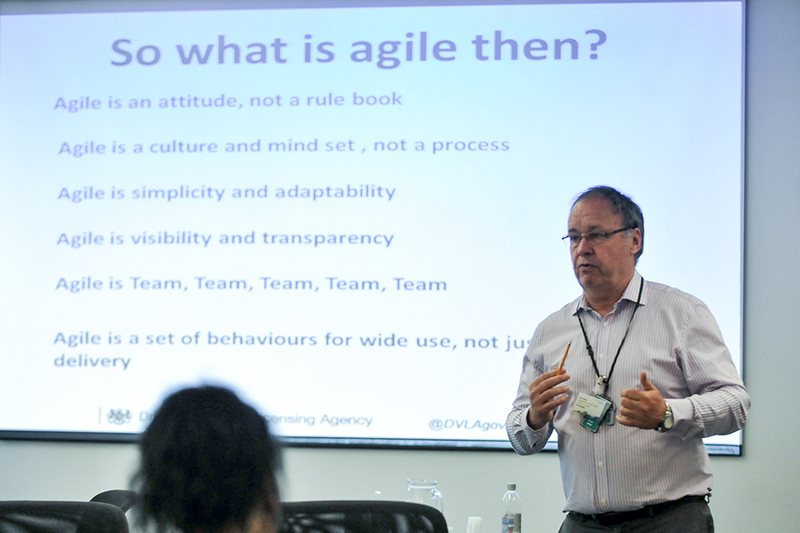 Agile Leadership for DVLA. 21 months. Asked by a friend (I thought he was anyway) to help with an interesting (the term he used) challenge in sunny (yes he did say sunny) Wales for the digital transformation of a Government Department. The difference those agile mindset light bulb moments can make to individuals. Seeing the people grow in confidence as they learn by doing makes it worthwhile. Bringing up my 2 young adults to be decent human beings. Reading � all my life. I would love to see people and organisations understand that agile is actually a mindset/culture/way of working that can be adopted without �killing� traditional ways and methodologies. Agile not only helps delivery but can also significantly change (improve) organisational culture. - Sir Clive Woodward�s autobiography (a real insight into building high performing teams) � a must read for any Manager or Leader. - Any of the Harry Potter books that help bring a little magic into our ways of thinking - Robert Holden �Be Happy�. Showing that work behaviours are a choice For me these books highlight what agile can be � high performing teams delivering magical solutions with the right choice of behaviours. My wife, my 2 young adults (I count them as one family package) and my credit card. Technology agnostic � as long as it works and supports what I am trying to do in any given scenario. No preference - I prefer human interaction. There are loads (modesty is not one) so just a couple of examples � I have been to tea with the Queen (twice) - Been mentioned on Match of the Day for flattening John Motson (I really enjoyed that) � Played rugby at Murrayfield (I didn�t enjoy that, painful experience) - Got an ex-England cricket Captain out while bowling (he was caught) - For being the oldest person in the history of my Karate style to achieve a Black Belt � Me and my bag being in the pictorial history of DVLA (priceless) � Attending a Boxing day football match between Reading and Cardiff dressed as a Pantomime Dame (for charity) � I hold the local (men�s) football league goal scoring record of 13 goals in one game. I would have to play myself so as not to adversely impact any actors career by being associated with such a big flop at the box office. Sir Bobby Charlton � opportunity to talk football over a meal is something that is not really encouraged at home. I am still learning more and more about karate every time I go � one day I might even get to be good at it and be able to walk properly after a training session!. I would like to think my spirit animal would be an Orangutan because they are such chilled out animals that simply hang out but in reality it is more likely that others see me as a bit of a Tasmanian Devil. Superpower would have to be eating � If only eating was an Olympic sport! Thanks, Jim! Remember, if you want to get involved just click: I want to Play 20 Questions with TechHub Swansea! Are you ready to #StartUpTheSeason?